Don't you sing? :) - You don't know me. I have mixed feelings about the food court musical. I like the idea, but I sort of wish the song had been about something more important than napkins, because I think that a song about napkins makes fun of musicals more than makes me wish life was one. i am curiously uninspired for the caption contest!!! Yeah, I think it could have been better done, but I did laugh when the security guard came in. That was kind of awesome. And awww. But it's Benjamin Linus! LOL, right? ;) Love it! "Let's see how long it takes for her to notice I unplugged her computer monitor... mwaaa-haaa-haaa"
"Mark looked over his shoulder to assess the situation. 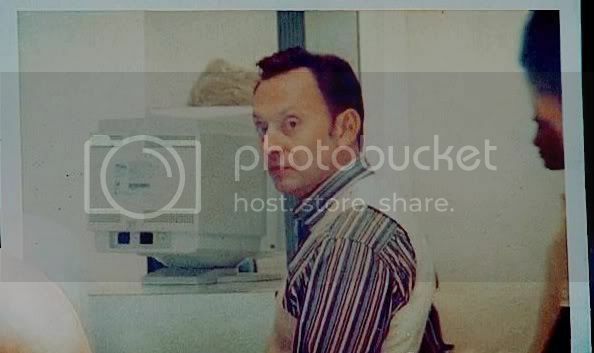 Yup, he was still the gayest man at Hewlett-Packard." "This is the last time I take American Airlines. All these damn cancellations are ruining precious time on the island." They are! He's a truly incredible actor. "Isn't it time for me to get another beating yet?" "Oh no! randomposting is going to turn me into a caption contest for sure!" I have been a fan of Improv Everywhere for YEARS and want to run away to New York and become an agent! I highly recommend "The Moebius", "Rob!" and "Ted's Birthday" to peruse... most of the older... uh.. things (shows? games? jokes?..uh.. ?) don't have video (or have VERY bad video) but they are great!! indeed there he was, across the room after all this time. His old nemmasis, the funny looking american fighter ace with the big nose.., The red barnon shuddered softly and hoped he would not notice him. "Some Guy: The Denholm Elliot Years!" I don't get the reference. Aww. "He let one rip and tried to look nonchelant."